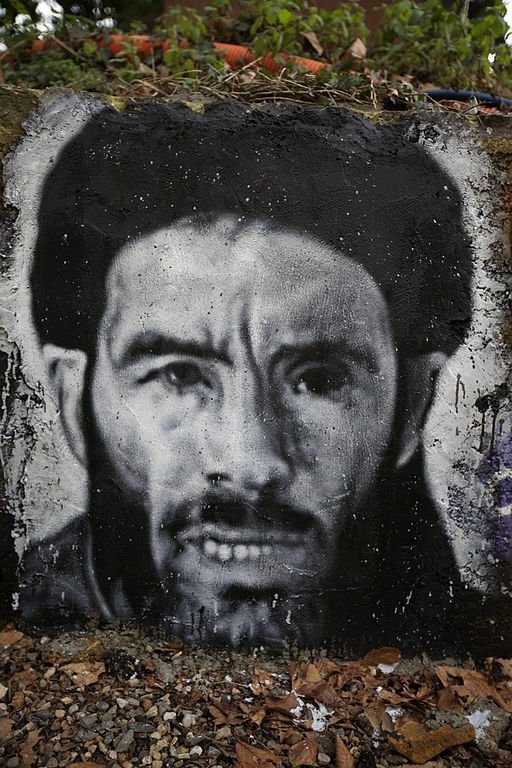 Graffiti portrait of Algerian terrorist leader Mokhtar Belmokhtar. Photo by thierry ehrmann. In an op-ed for The National, Dr. Dalia Ghanem-Yazbeck notes the similarities between the Armed Islamic Group (GIA) during the Algerian Civil War of the 1990s and present day ISIS. She makes the case that strategies of decay and infiltration used to combat the GIA may also help fight ISIS. The GIA were infamous for massacres of civilians and public terrorist attacks. The GIA also controlled significant territory, established their own Caliphate, and provided social services, all of which parallel present-day ISIS. While ISIS is in some ways a new threat, investigating similarities to other violent non-state actors and the environments in which they operate may provide insights into combating ISIS and other violent non-state organizations. 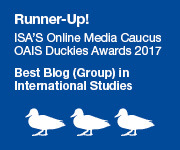 Competition between violent political organizations has been found to increase group longevity and lead to more “shocking attacks”. A recent post in this blog makes the case that competition between ISIS and al Qaeda has contributed to the escalation in the level of violence used by ISIS. The GIA in Algeria were also locked in heated competition with rival Islamic Salvation Army (AIS). The two sides exchanged threats, direct attacks, and assassinations of each others leadership, while fighting in a civil conflict with thousands of casualties. To distance itself from the more brutal GIA, the AIS focused attacks primarily on government targets. The AIS then engaged in negotiations with the Algerian government, agreed to a ceasefire, and even offered the Algerian Government assistance in fighting the GIA. The Algerian case may provide some hope that groups involved in the conflict in Syria and Iraq that are more “moderate”, at least in terms of the tactics they employ, may be able to reconcile their differences and potentially aid in fighting ISIS. However, determining which groups are moderate is also a challenge, as many groups in the conflict have affiliations with al Qaeda, or hold views similar to ISIS. While investigating an organization’s actions rather than their ideology seems like a sensible screening method, this is also difficult in a constantly changing environment. The Algerian case provides some cause for caution. The Salafist Group for Preaching and Combat (GSPC) in Algeria sold itself as a more moderate group than the GIA by engaging in fewer attacks against the Algerian public. They were able to recruit many former GIA supporters and ultimately overtook the GIA. However, in the mid-2000s the GSPC merged with al-Qaeda in the Islamic Maghreb (AQIM) and engaged in a series of high profile kidnappings and attacks. When faced with declining support in the region the GSPC also reneged on its prior commitment and engaged in violence against the civilian public. This may suggest that while an organization fighting ISIS may be more moderate today, it is uncertain if their tactics will change when faced with decreased capabilities or support. Suggesting the US should “support moderate groups” provides limited leverage before defining what makes a group moderate (ideology, tactics, goals etc. ), and addressing the fluidity of the goals and actions of violent non-state organizations in civil conflicts. Another link between these two conflicts is the presence of al Qaeda. While it is now common knowledge that ISIS is a former al Qaeda affiliate and current rival, less well known is a similar tumultuous relationship between the GIA and al Qaeda. In the early 1990s Osama Bin Laden met with GIA leadership and provided tens of thousands of dollars of funding to the organization. However, the GIA’s massacres of the Muslim population in Algeria clashed with al Qaeda’s broader goals, leading al Qaeda to condemn the GIA and ultimately pull their support. However, this loss of support did not slow the use of extreme violence by the GIA in Algeria. A similar dynamic has also played out between al Qaeda and ISIS. al Qaeda has condemned ISIS for their brutality and severed ties with the organization. In both cases, the organizations were deemed too brutal for al Qaeda, and seem to have amplified their violence after losing their affiliation and constraints placed on them by al Qaeda. The fact that al Qaeda is still in operation, while the GIA is long gone, also speaks to the resiliency of the organization. While al Qaeda may currently be down, they are not out. Recent attacks in Mali by al Qaeda affiliates are thought to be a response to ISIS’s attack on Paris, creating the potential for additional “outbidding” between the two groups. al Qaeda may take a route similar to the GSPC in Algeria and engage in more attacks against government forces and Westerners, to differentiate themselves from ISIS’s attacks that are often directed at the Muslim population. 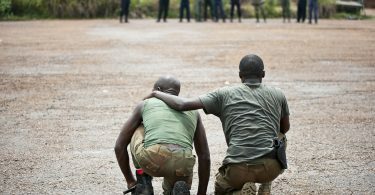 Higher profile attacks like the one on the Radisson Blu in Mali may also help al Qaeda gain media coverage while alienating fewer potential recruits, strengthening the organization. The increased focus on ISIS may also allow al Qaeda to regroup. An understanding of the Algerian context may be additionally important as the attack in Mail is suspected to be carried out by an al Qaeda affiliate lead by an Algerian, Mokhtar Belmokhtar, who previously held leadership roles and ran smuggling operations for the GIA, GSPC, and AQIM. While the GIA and ISIS differ in many respects, we may still be able to learn from their similarities and the strategies used to combat them. In particular, a better understanding of the impact of competition between violent non-state groups and the dynamics of terrorism in civil conflict should help inform current policy. Aside from the similarities between the GIA and ISIS, an understanding of the Algerian Civil War is relevant for the challenges of terrorism today. It was in Algeria and the surrounding areas that al Qaeda was able to extend into Africa though AQIM, resulting in a series of violent attacks and kidnappings that helped fund al Qaeda’s global operations. Today ISIS controls territory in Libya and there are worries of the group extending further into North Africa. A greater understanding of the region and its history of violent political organizations may aid in combating ISIS and other violent non-state organizations. Kevin Greene is a PhD student in Political Science and affiliate of the Social Science Data Analytics initiative at Michigan State University. Great article. I really think that comparisons between the Algerian Civil War and the current conflict in Syria can be illustrative. Further supplementing your analysis, there are also many parallels between the response of both the Syrian and Algerian regimes, particularly in the use of seemingly indiscriminate violence. This serves to polarize the Syrian population into pro and anti regime camps, further lending credence to Assad’s notion that all the opposition are terrorists. Furthermore, I would not be surprised if the Syrian Arab Arab manages to hold territory in the Idlib and Aleppo provinces, they negotiate a settlement with more “moderate” opposition elements. This tactic mirrors that of the Algerian gov’t especially with respect to the AIS. A succession of amnesties would most likely follow. 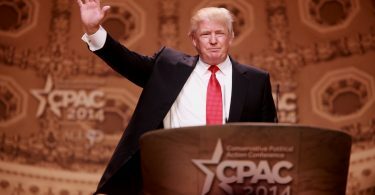 The only issue is that unlike Algeria, the levers of power are all controlled by the Assad family and his supporters. There is no shadowy pouvoir in charge. It seems impossible that Assad could be an acceptable Bouteflika type figure. Nevertheless, the comparison should further explored, especially vis-à-vis regime tactics. Violence in the Syrian conflict may be indiscriminate and totalizing, but it does not represent a lack of strategy. Indeed, the deployment of violence is the only way of securing power in this conflict.